Cellulase is the one of the largest contributors to the high production costs of the lignocellulose-based biorefineries. As the most widely used cellulase producer, Trichoderma reesei has two weaknesses, deficiencies in β-glucosidase and cellobiohydrolase II. This work aimed at solving this problem by simultaneous enhancement of the beta–exo synergism and exo–exo synergism in T. reesei cellulase to increase the cellulose degrading capability, i.e. enhanced co-expression of the β-glucosidase gene the cellobiohydrolase II gene of T. reesei. Enhanced co-expression of the β-glucosidase gene and the cellobiohydrolase II gene in T. reesei using the strong promoter Pcbh1 was found successful in overcoming the two weaknesses. Filter paper activities of T. reesei cellulase were greatly elevated, which were 7.21 ± 0.45 (E7, Aabgl1 and Trcbh2) and 7.69 ± 0.42 (F6, Anbgl1 and Trcbh2) FPIU/mL. They were much higher than that of the parental strain Rut-C30, 2.45 ± 0.36 FPIU/mL. Enzymatic hydrolysis yields were also improved, from 67.22 ± 1.61% by Rut-C30 cellulase to 87.98 ± 0.65% by E7 cellulase and 86.50 ± 1.01% by F6 cellulase. The substrate loading for 1 g glucose release from SECS were decreased, from 2.9637 g SECS using Rut-C30 cellulase to 2.0291 g SECS using E7 cellulase and 2.0573 g SECS using F6 cellulase. As a result, the efficiency of the process from SECS to glucose was substantially improved. Enhanced co-expression of the β-glucosidase gene and the cellobiohydrolase II gene in T. reesei using the strong promoter Pcbh1 in T. reesei was proven triumphal in the simultaneous enhancement of the beta–exo synergism and exo–exo synergism in T. reesei cellulase. 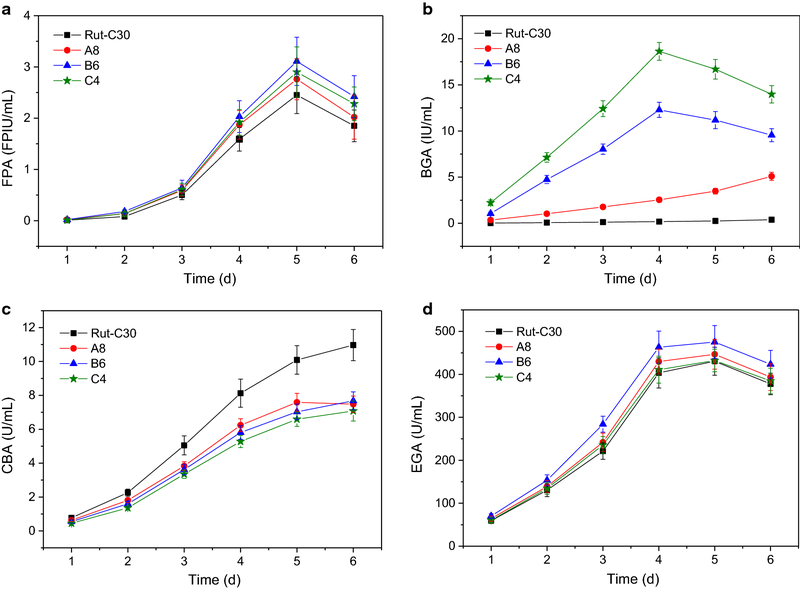 This strategy also improved the cellulase production, enzymatic hydrolysis yield and the efficiency of the process from SECS to glucose in the context of on-site cellulase production. This work is a commendable attempt in the cellulase composition optimization at the transcriptional level. Cellulase is one of the hindrances to the commercialization of lignocellulose-based biorefineries [1–3], because of the fact that cellulase preparations in market are too expensive. Therefore, increasing the productivity and the specific activity of cellulase, improving the performance in the enzymatic hydrolysis of lignocelluloses, and reducing the production cost and the application cost of cellulase are key to making the biorefineries economically competitive. As one of the most widely used cellulase producers in industry, Trichoderma reesei has the most robust cellulase and the production level was up to 100 g/L [3–5]. T. reesei cellulase has three categories of components: cellobiohydrolases (CBH: EC 3.2.1.91), which liberate cellobiose molecules from the reducing and nonreducing ends of a cellulose chain; endoglucanases (EG: EC 3.2.1.4), which attack internal bonds in the cellulose chain; and β-glucosidases (BG: EC 3.2.1.21), which hydrolyze cellobiose into glucose [1, 4, 6, 7]. Only the complete and balanced composition of the cellulase can accomplish the efficient enzymatic hydrolysis of cellulosic materials [7–10]. The components of the cellulase collaborate for the enzymatic hydrolysis of cellulose. A concept capable of describing this kind of co-work is synergism [4, 11, 12]. According to the optimal composition of the cellulase both in theory and in practice, T. reesei cellulase must have balanced composition to lead to utmost synergism and superb performance in enzymatic hydrolysis of lignocellulose [4, 8, 13]. Though T. reesei is one of the most robust cellulase-producers [14–16], the composition of its cellulase is not sufficiently excellent for various applications [4, 8, 17–19]. The two extensively reported weaknesses are the deficiencies of BG and CBH II [1, 4, 6, 7, 17, 20–22]. Many approaches had been proposed to overcome BG deficiency: direct addition of external BG into cellulase mixture [23–25]; co-cultivation with Aspergillus strains [1, 17, 26]; and genetic engineering of T. reesei for enhancing BG [20–22]. CBH II deficiency had been overcome by adding external CBH II into cellulase mixture or enhancing CBH II production by T. reesei [6, 7, 27]. However, these researches just tackled one of the weaknesses. The previous work succeeded to solve the two problems by combining genetic engineering and co-cultivation . Thus, why not genetically engineer T. reesei for the simultaneous enhancement of beta–exo synergism and exo–exo synergism to overcome the two weaknesses once and for all? In this work, three different BG genes from T. reesei, Aspergillus aculeatus and Aspergillus niger were placed under the control of T. reesei’s Pcbh1 strong promoter respectively, and then introduced into T. reesei. The resulted T. reesei transformants were compared in the fermentation for cellulase production. Then the three strong expression cassettes were linked to the strong expression cassette of T. reesei cbh2 ditto using Pcbh1. These strong expression cassettes of BG genes and CBH II were introduced into T. reesei respectively, and the resultant transformants were compared in the fermentation for cellulase production. The cellulases from all the T. reesei transformants were compared in the enzymatic hydrolysis to select the most potent cellulase and its producer, and more importantly to prove which combination of BG and CBH II expression cassettes is the best for the simultaneous enhancement of the beta–exo synergism and exo–exo synergism in T. reesei cellulase. The BG genes including bgl1 (GenBank accession: D64088) from A. aculeatus (abbreviated as Aabgl1) and bgl1 (GenBank accession: KJ739789) from A. niger (abbreviated as Anbgl1) were codon-optimized according to the T. reesei’s codon preference . The genes, bgl1 (GenBank accession: U09580) and cbh2 (GenBank accession: M16190) from T. reesei which were abbreviated as Trbgl1 and Trcbh2, do not need codon-optimizing because they were expressed homologously. All these gene sequences, whose signal peptide sequences and introns were deleted, were synthesized by Generay Biotech (Shanghai, China). By subcloning, these sequences were linked to the promoter Pcbh1 with the signal peptide sequence of cbh1 and the terminator Tcbh1 from T. reesei to form the strong expression cassettes, which were then linked to the plasmid pCAMBIA1300 to form the final vectors [4, 7], as shown in Fig. 1. Escherichia coli DH5α was used for plasmid constructions and propagations. Agrobacterium tumefaciens AGL-1was used for transformation of T. reesei. T. reesei Rut-C30 was used as host for genetic engineering [4, 7]. All these microorganisms are preserved in Biomass Energy Center for Arid and Semi-arid Lands, Northwest A&F University. The lignocellulosic material used here was corn stover, which was collected from Kaifeng City, Henan Province in the year of 2015. It was sized down to a length of 5–10 cm, rinsed with tap water to remove sticky clay, and then air-dried for short term storage. Steam explosion was used as the pretreatment method [1, 2, 4, 29]. After the pretreatment, the steam exploded corn stover (SECS) was washed with distilled water until neutral pH to remove inhibitors. The composition of the washed SECS was as follows (dry biomass): glucan 53.2%, xylan 6.9%, lignin 22.7%, ash 11.2%, and others 6.0%. Luria–Bertani (LB) medium was used to cultivate E. coli and A. tumefaciens, which had the following composition (g/L): tryptone 10, yeast extract 5, NaCl 10. The LB medium was autoclaved at 121 °C for 20 min. For LB agar slants or plates, 1.5 g agar was added before autoclave. Rifamycin and/or Kanamycin were added when selective LB media were prepared. Induction medium (IM) for A. tumefaciens-mediated transformation (AMT): add 0.8 mL of K-buffer, 20 mL of MN buffer, 1 mL of 1% (w/v) CaCl2∙2H2O, 10 mL of 0.01% (w/v) FeSO4, 5 mL of trace elements for IM medium, 2.5 mL of 20% (w/v) NH4NO3, 10 mL of 50% (vol/vol) glycerol, 40 mL of 1 M MES, pH 5.5, and 10 mL of 20% (w/v) glucose to 900.7 mL of sterilized water to make up 1 L of liquid IM . The composition of the seed medium for pre-culturing T. reesei was as follows: 10 g/L glucose, 1 g/L peptone, 5 mL Mandels nutrient salts solution , 2.5 mL citrate buffer (1 mol/L), 0.05 mL Mandels trace elements solution , 0.1 g/L Tween 80. This seed medium was autoclaved at 121 °C for 20 min. The fermentation medium for cellulase production by T. reesei was composed of 30 g/L SECS (dry biomass), 1 g/L glucose, 6 g/L (NH4)2SO4, 2.0 g/L KH2PO4, 0.3 g/L CaCl2, 0.3 g/L MgSO4, 0.005 g/L FeSO4, 0.0016 g/L MnSO4, 0.0014 g/L ZnSO4 and 0.0037 g/L CoCl2. The initial pH was adjusted to 4.8 with citrate buffer. This fermentation medium was autoclaved at 121 °C for 30 min. The medium (MCC agar plates) for the second step of T. reesei transformant screening was composed of 20 g/L microcrystalline cellulose (MCC), 5 g/L (NH4)2SO4, 15 g/L KH2PO4, 0.8 g/L MgSO4, 0.6 g/L CaC12, 0.005 g/L FeSO4·7H2O, 0.0016 g/L MnSO4·H2O, 0.0014 g/L ZnSO4·7H2O, 0.0037 g/L CoCl2·6H2O, 20 g/L agar. The initial pH was adjusted to 4.8 with citrate buffer. This medium was autoclaved at 121 °C for 20 min. Hygromycin B was added to a final concentration of 100 mg/L. Then it was poured into Petri dishes to form MCC agar plates [4, 7]. All the chemicals used in preparing theses media were purchased from Sinopharm Chemical Reagent Co. Ltd., Shanghai, China. All the antibiotics used here were bought from Sangon Biotech, Shanghai, China. AMT of T. reesei and transformant screening was conducted according to the reported protocols with slight modifications [4, 7, 30]. The recombinant vector was transformed into A. tumefaciens. Then A. tumefaciens transformants harboring the vectors (Fig. 1) were co-cultured with T. reesei spore germlings in liquid IM medium and then the co-culture mixtures were spread on the nitrocellulose filters tiled on the IM agar plates. They were incubated at 24–25 °C for 2–3 days. Subsequently, the nitrocellulose filters carrying green spores with potential T. reesei transformants and remaining A. tumefaciens were reversely paved on the PDA agar plates containing 200 μM cefotaxime to kill A. tumefaciens cells and 100 μg/mL hygromycin B to select potential T. reesei transformants. This was the first step of transformant screening. T. reesei transformants appeared on the selective PDA agar plates were transferred to the MCC agar plates for the second step of transformant screening where transformant’s growth rate was used as the selection criterium [4, 7]. The fast-growing T. reesei transformants were chosen and compared in the following experiments. Trichoderma reesei must be pre-cultured for 36 h to reach a certain amount of biomass for the subsequent fermentation. The pre-culture was operated at 30 °C with a shaking of 170 rpm in 250 mL Erlenmeyer flasks with 50 mL of the seed medium. Then 5 mL (10% v/v) of the pre-cultures were inoculated into the fermentation medium for cellulase production. The fermentation was carried out in shaking incubator (170 rpm) at 30 °C on the first day and 28 °C since then. Sampling was conducted once a day during the fermentation process for analyses. In order to compare the cellulases from different T. reesei strains, the enzymatic hydrolysis of SECS was implemented in 250 mL Erlenmeyer flasks with a working volume 50 mL containing 2.5 mL 1 M citrate buffer solution (for final pH 4.8), 100 g/L SECS (dry material), 25 FPIU/g glucan the cellulase harvested after 5 days fermentation, and a supplementary amount of water to make up 50 mL. After the cellulase being added, these flasks were incubated in an orbital shaker (140 rpm) at 50 °C for 48 h.
Filter paper activity (FPA) was assayed using the standard method recommended by the International Union of Pure and Applied Chemistry (IUPAC) , which measures the total amount of the reducing sugars released from 50 mg Whatman No.1 filter paper (1 × 6 cm strip) in 60 min reaction. One International Unit of FPA (FPIU) was defined as the amount of enzyme needed for releasing 1 μmol reducing sugars in 1 min. β-Glucosidase activity (BGA) was determined using the standard method recommended by IUPAC  but the substrate was ρNPG (ρ-nitrophenyl-β-d-1,4-glucopiranoside) (Sigma-Aldrich, St. Louis, MO, USA). The amount of ρ-nitrophenol formed in 10 min of the reaction was quantified spectrophotometrically at 400 nm. One International Unit of BGA (IU) was defined as the amount of enzyme required for releasing 1 μmol of ρ-nitrophenol in 1 min. The methods for assaying cellobiohydrolase activity (CBA) and endoglucanase activity (EGA) were modified from the FPA measurement method . Microcrystalline cellulose PH101 and carboxymethyl cellulose (Sigma-Aldrich, St. Louis, MO, USA) in terms of 1% (w/v) suspensions were used as the substrates for the reactions with the duration of 30 min. One Unit (1 U) of CBA or EGA was defined as the amount of enzyme needed for producing 1 mg reducing sugars in 1 h.
Glucose released from the enzymatic hydrolysis of SECS was quantified using a HPLC system (Agilent 1100) equipped with Bio-Rad Aminex HPX-87H (300 mm × 7.8 mm). Deionized and degassed water was used as the mobile phase at a low rate of 0.6 mL/min. The column temperature was maintained at 55 °C. The eluate was detected by a refractive index detector. At least triplicates were used in all analyses and data are presented in the form of mean ± standard deviation. The recombinant vector pCAMBIA1300-Ps-Trbgl1-T (Fig. 1a) carrying the strong cassette of T. reesei bgl1 gene was transformed to T. reesei by AMT, producing 203 transformants. pCAMBIA1300 is the backbone, Ps the strong promoter of the T. reesei cbh1 gene and its signal peptide sequence, Trbgl1 the T. reesei bgl1 gene, and T the terminator of the T. reesei cbh1 gene. After the two steps of transformant screening, 10 fastest-growing transformants were selected to compare their BGAs and FPAs, as presented in Fig. 2a. The number 0 stands for the parental strain, i.e. T. reesei Rut-C30, and the numbers 1 to 10 are the T. reesei transformants. The ten T. reesei transformants A1–A10, cultured on the PDA agar plates without hygromycin B and were passed on from generation to generation for 10 times, were verified by genome PCR for the stable existence of the strong cassette of T. reesei bgl1 gene in their chromosomal DNA (data not shown). It was found that the BGAs of the 10 fastest-growing transformants were obviously improved while their FPAs were slightly higher than the parental strain, which in line with the previous report . Though the increase of the BGAs here were larger than those in the previous report, the FPAs were nearly the same. The possible reasons included that different T. reesei transformation method and different BGA assay method were used here. Among the 10 fastest-growing transformants, the 8th transformant (named as A8) had the highest BGA and FPA which were 1.03 ± 0.11 IU/mL and 0.14 ± 0.04 FPIU/mL after 48 h fermentation. They were 14.71 and 1.75 times higher than those of the parental strain, which were 0.07 ± 0.02 IU/mL and 0.08 ± 0.03 FPIU/mL after 48 h fermentation. The recombinant vector pCAMBIA1300-Ps-Aabgl1-T (Fig. 1b) carrying the strong cassette of A. aculeatus bgl1 gene was transformed to T. reesei, producing 236 transformants. pCAMBIA1300 is the backbone, Ps the strong promoter of the T. reesei cbh1 gene and its signal peptide sequence, Aabgl1 the A. aculeatus bgl1 gene, and T the terminator of the T. reesei cbh1 gene. After the two steps of transformant screening, 10 fastest-growing transformants were picked off to compare their BGAs and FPAs which are shown in Fig. 2b. The number 0 is T. reesei Rut-C30, and the numbers 1 to 10 are the T. reesei transformants. The ten T. reesei transformants B1–B10, cultured on the PDA agar plates without hygromycin B and were passed on from generation to generation for 10 times, were verified by genome PCR for the stable existence of the strong cassette of A. aculeatus bgl1 gene in their chromosomal DNA (data not shown). As shown in Fig. 2b, the BGAs of the 10 fastest-growing transformants were greatly improved and their FPAs were higher than Rut-C30. The results resemble the previous work, especially for BGA increasement, but FPA increasement here was a little higher . Among the 10 fastest-growing transformants, the 6th transformant (named as B6) had the highest BGA and FPA which were 4.74 ± 0.44 IU/mL and 0.18 ± 0.03 FPIU/mL after 48 h fermentation. 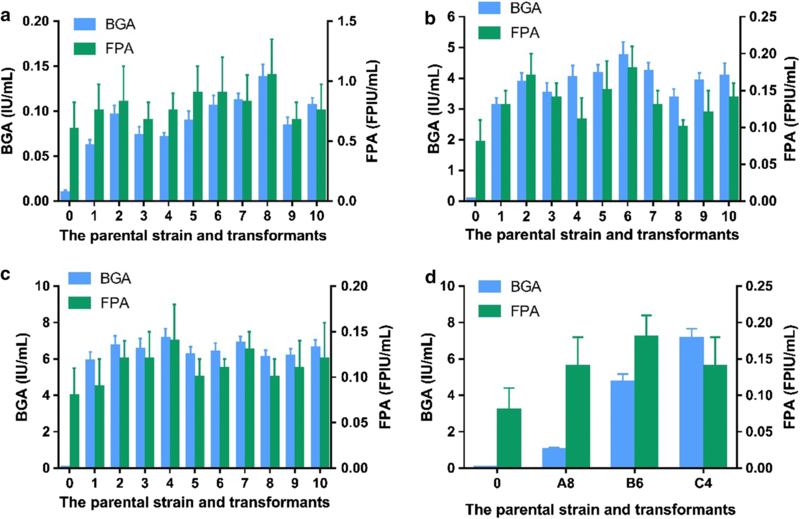 They were 67.71 and 2.25 times higher than those of the parental strain whose BGA and FPA were 0.07 ± 0.02 IU/mL and 0.08 ± 0.03 FPIU/mL after 48 h fermentation. The recombinant vector pCAMBIA1300-Ps-Anbgl1-T (Fig. 1c) carrying the strong cassette of A. niger bgl1 gene was transformed to T. reesei, producing 217 transformants. pCAMBIA1300 is the backbone, Ps the strong promoter of the T. reesei cbh1 gene and its signal peptide sequence, Anbgl1 the A. niger bgl1 gene, and T the terminator of the T. reesei cbh1 gene. After the two steps of transformant screening, 10 fastest-growing transformants were selected to compare their BGAs and FPAs which are presented in Fig. 2c. The number 0 is T. reesei Rut-C30, and the numbers 1 to 10 are the T. reesei transformants. The ten T. reesei transformants C1–C10, cultured on the PDA agar plates without hygromycin B and were passed on from generation to generation for 10 times, were verified by genome PCR for the stable existence of the strong cassette of A. niger bgl1 gene in their chromosomal DNA (data not shown). It was also found in Fig. 2c that the BGAs of the 10 fastest-growing transformants were prodigiously improved and their FPAs were higher than Rut-C30. The results are almost the same as the previous report . Among the 10 fastest-growing transformants, the 4th transformant (named as C4) had the highest BGA and FPA which were 7.14 ± 0.52 IU/mL and 0.14 ± 0.04 FPIU/mL after 48 h fermentation. They were 102.00 and 1.75 times higher than those of the parental strain, 0.07 ± 0.02 IU/mL and 0.08 ± 0.03 FPIU/mL after 48 h fermentation. Then the BGAs and FPAs of the outperformed T. reesei transformants (A8, B6, C4) were compared, as shown in Fig. 2d. It was found that the transformant C4 had the highest, much higher BGA than B6 and A8. Next in line is the transformant B6. The difference in specific enzymatic activity of these three β-glucosidases maybe lead to the different results. The previous cases [20–22] were repeated and compared here in the same research. The possible reason for the large BGA increase but small FPA increase is that FPA determination method assayed the total amounts of reducing sugars but not merely glucose [32, 33]. In addition, though β-glucosidases play an important role in enzymatic hydrolysis of lignocelluloses [1, 17, 23], the contribution of β-glucosidases to overall yield is not so large [13, 34]. This means the increase of β-glucosidase content in cellulase mixture from 1 to 3% or 4% is sufficient for efficient enzymatic hydrolysis [13, 34] and the overproduction of β-glucosidase is a kind of waste which has been already beyond the demand of real-world applications. The following experiment of enzymatic hydrolysis would also prove this statement. The time courses of the cellulase production by the T. reesei transformants A8, B6 and C4, as well as the control Rut-C30 are shown in Fig. 3. It was found in Fig. 3a that the FPAs of the transformants A8, B6 and C4 were not largely improved during the fermentation process as the BGAs were enhanced. Besides the explanations given above, the small decrease in CBAs (Fig. 3c) offset the increase caused by the elevated production of BGAs because CBA has very grand contribution [13, 34]. The decrease in CBAs should be attributable to that the energy of the strong promoter Pcbh1 was partially diverted to the enhanced expression of the bgl1 gene, i.e. transcription titration effect . No significant difference was found in EGAs (Fig. 3d). This is because the genetic engineering strategy of this work did not touch endoglucanases. The minor difference in BGAs was probably caused by the interfering effect of the BGA and CBA changes and the errors from fermentation and enzymatic activity assay. It is noteworthy that though the BGAs of the transformants B6 and C4 were much higher than those of A8 and Rut-C30, they declined faster than the latter ones. They peaked on day 4 but the BGAs of A8 and Rut-C30 continued to increase during the fermentation process. This may be because the β-glucosidase genes expressed in B6 and C4 were from A. aculeatus and A. niger, i.e. heterologous, making them unstable because heterologous proteins are much easier to be degraded by the proteases from the host [35, 36]. The cellulases produced by the strains A8, B6, C4 and Rut-C30 were harvested after 5 days fermentation because their FPAs, which reveal the total activities of the cellulases, peaked on day 5 [1, 7, 24]. These cellulases were applied to the enzymatic hydrolysis of SECS and the results are presented in Table 1. 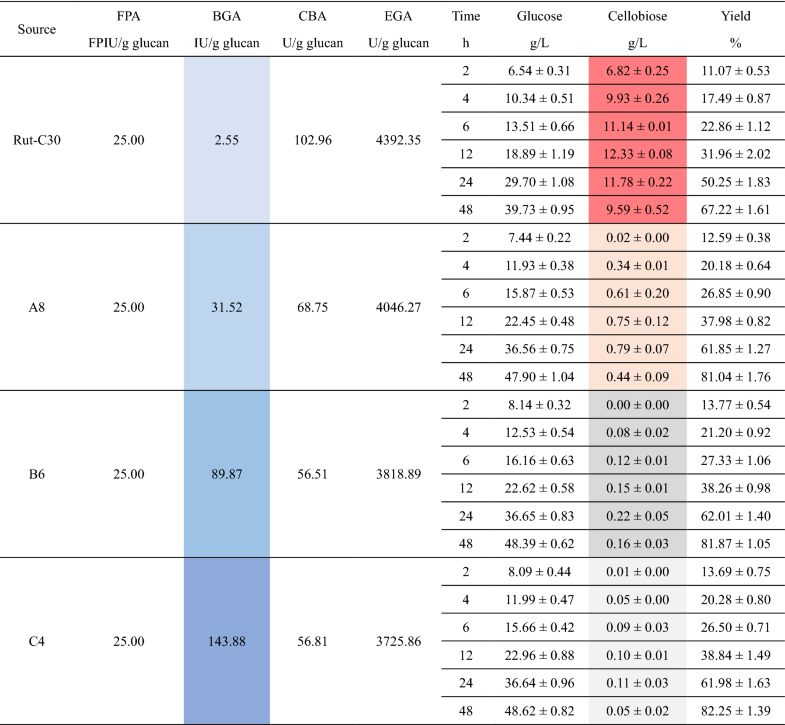 When using the same dosage, the cellulase from the parental strain Rut-C30 was found to have the serious cellobiose accumulation which negatively affected the enzymatic hydrolysis yield (red-colored in Table 1). Nevertheless, the enhanced production of β-glucosidases was proven capable of overcoming cellobiose accumulation and improving the enzymatic hydrolysis yield. From A8 to C4, the three cellulases reduced cellobiose concentrations to the neglectable level, lower than 1 g/L, and increased enzymatic hydrolysis yields to the desirable level, higher than 80%. As BGA increased further, however, enzymatic hydrolysis yield no longer increased. 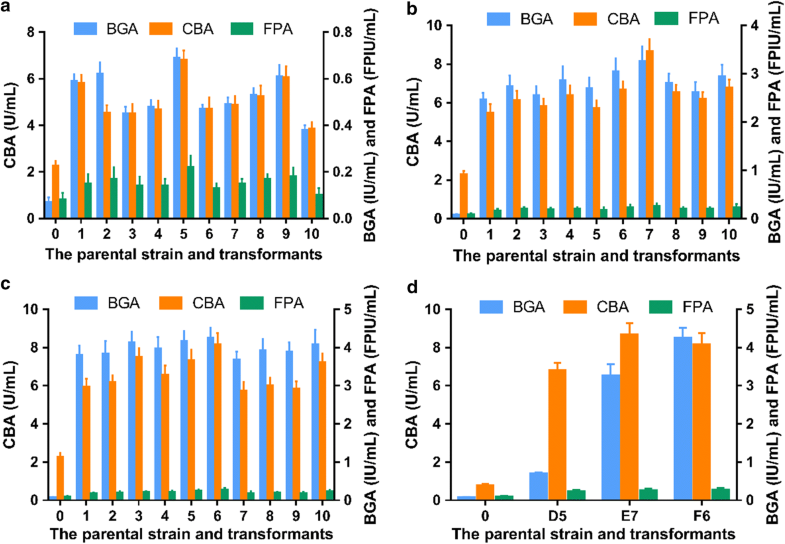 This suggests that the BGA of A8 was high enough alleviate cellobiose accumulation and the BGAs beyond that were useless, unable to improve enzymatic hydrolysis yield any more. Hence, the wasted energy for overproduction of β-glucosidases was used for the enhanced production of CBH II because CBH components are the most important in the enzymatic hydrolysis of lignocelluloses [13, 18, 34] but T. reesei lacks of sufficient CBH II for efficient exo–exo synergism [6, 7]. In our previous studies [4, 7], FPA was enhanced as CBA was raised using the T. reesei strong promoter Pcbh1. 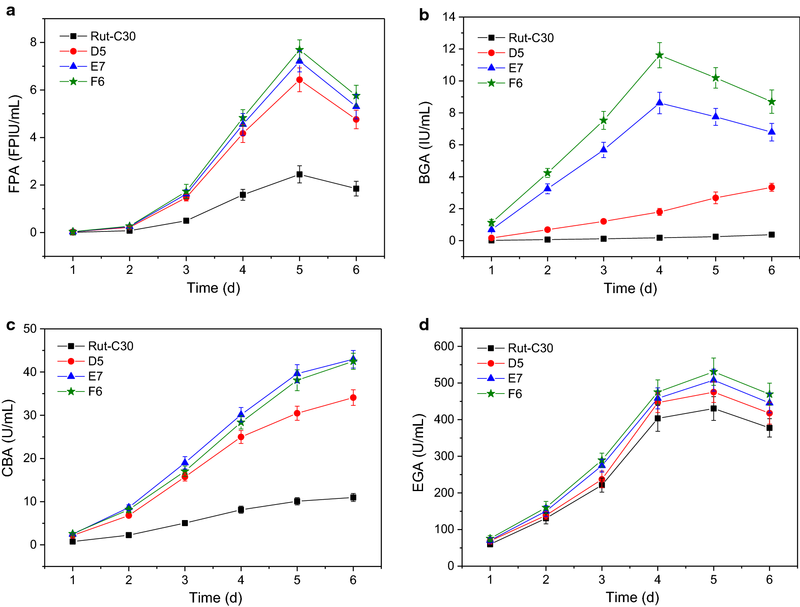 This work adopted the same strategy to improve the CBH II production and BG production at the same for the simultaneous enhancement of the beta–exo synergism and exo–exo synergism in Trichoderma reesei cellulase. The recombinant vector pCAMBIA1300-Ps-Trbgl1-T-Ps-Trcbh2-T (Fig. 1d) carrying the strong cassettes of T. reesei bgl1 gene and cbh 2 gene was transformed to T. reesei, producing 230 transformants. pCAMBIA1300 is the backbone, Ps the strong promoter of the T. reesei cbh1 gene and its signal peptide sequence, Trbgl1 the bgl1 gene of T. reesei, Trcbh2 the cbh2 gene of T. reesei, and T the terminator of the T. reesei cbh1 gene. After the two steps of transformant screening, 10 fastest-growing transformants were selected to compare their BGAs, CBAs and FPAs which are presented in Fig. 4a. The number 0 is T. reesei Rut-C30, and the numbers 1 to 10 are the T. reesei transformants. The ten T. reesei transformants D1–D10, cultured on the PDA agar plates without hygromycin B and were passed on from generation to generation for 10 times, were verified by genome PCR for the stable existence of the strong cassettes of T. reesei bgl1 gene and cbh 2 gene in their chromosomal DNA (data not shown). It was found in Fig. 4a that the FPAs, CBAs and the BGAs of the transformants were substantially increased at the same time. Among the 10 fastest-growing transformants, the 5th transformant (named as D5) had the highest FPA, CBA and BGA which were 0.22 ± 0.05 FPIU/mL, 6.79 ± 0.42 U/mL and 0.69 ± 0.04 IU/mL after 48 h fermentation. They were 2.75, 3.00 and 9.86 times higher than the counterparts of Rut-C30, which were 0.08 ± 0.03 FPIU/mL, 2.26 ± 0.21 U/mL and 0.07 ± 0.02 IU/mL after 48 h fermentation. The recombinant vector pCAMBIA1300-Ps-Aabgl1-T-Ps-Trcbh2-T (Fig. 1e) carrying the strong cassettes of A. aculeatus bgl1 gene and T. reesei cbh2 gene was transformed to T. reesei, producing 212 transformants. pCAMBIA1300 is the backbone, Ps the strong promoter of the T. reesei cbh1 gene and its signal peptide sequence, Aabgl1 the bgl1 gene of A. aculeatus, Trcbh2 the cbh2 gene of T. reesei, and T the terminator of the T. reesei cbh1 gene. After the two steps of transformant screening, 10 fastest-growing transformants were selected to compare their BGAs, CBAs and FPAs, as shown in Fig. 4b. The number 0 is T. reesei Rut-C30, and the numbers 1 to 10 are the T. reesei transformants. The ten T. reesei transformants E1–E10, cultured on the PDA agar plates without hygromycin B and were passed on from generation to generation for 10 times, were verified by genome PCR for the stable existence of the strong cassettes of A. aculeatus bgl1 gene and T. reesei cbh2 gene in their chromosomal DNA (data not shown). It was found in Fig. 4b that the FPAs, CBAs and FPAs of the transformants were obviously improved. Among the 10 fastest-growing transformants, the 7th transformant (named as E7) had the highest FPA, CBA and BGA which were 0.25 ± 0.06 FPIU/mL, 8.65 ± 0.64 U/mL and 3.25 ± 0.31 IU/mL after 48 h fermentation. They were 3.13, 3.83 and 46.43 times higher than those of Rut-C30, which were 0.08 ± 0.03 FPIU/mL, 2.26 ± 0.21 U/mL and 0.07 ± 0.02 IU/mL after 48 h fermentation. The recombinant vector pCAMBIA1300-Ps-Anbgl1-T-Ps-Trcbh2-T (Fig. 1f) carrying the strong cassettes of A. niger bgl1 gene and T. reesei cbh2 gene was transformed to T. reesei, producing 205 transformants. pCAMBIA1300 is the backbone, Ps the strong promoter of the T. reesei cbh1 gene and its signal peptide sequence, Anbgl1 the bgl1 gene of A. niger, Trcbh2 the cbh2 gene of T. reesei, and T the terminator of the T. reesei cbh1 gene. After the two steps of transformant screening, 10 fastest-growing transformants were selected to compare their BGAs, CBAs and FPAs, as shown in Fig. 4c. The number 0 is T. reesei Rut-C30, and the numbers 1 to 10 are the T. reesei transformants. The ten T. reesei transformants F1–F10, cultured on the PDA agar plates without hygromycin B and were passed on from generation to generation for 10 times, were verified by genome PCR for the stable existence of the strong cassettes of A. niger bgl1 gene and T. reesei cbh2 gene in their chromosomal DNA (data not shown). It was found in Fig. 4c that the FPAs, CBAs and FPAs of the transformants were obviously improved. Among the 10 fastest-growing transformants, the 6th transformant (named as F6) produced the highest FPA, CBA and BGA which were 0.27 ± 0.05 FPIU/mL, 8.16 ± 0.60 U/mL and 4.24 ± 0.28 IU/mL after 48 h fermentation. They were 3.38-, 3.61- and 60.57-fold higher than those of Rut-C30, which were 0.08 ± 0.03 FPIU/mL, 2.26 ± 0.21 U/mL and 0.07 ± 0.02 IU/mL after 48 h fermentation. Then the BGAs, BGAs and FPAs of the T. reesei transformants (D5, E7, F6) with CBH and BG being simultaneously enhanced were compared, as shown in Fig. 4d. It was found that the transformant F6 had the highest BGA. Next in line was E7 and D5. Compared to Rut-C30 (numbered as 0 in Fig. 4d), all the transformants’ BGAs were greatly improved. The BGAs may be dependent on the sources of bgl1 genes because their enzymatic properties are different. Meanwhile, the CBAs were raised because the CBH II production was also enhanced by using the strong promoter Pcbh1 of T. reesei [6, 7, 24]. Different from the results above where only the BGAs were greatly improved but the FPAs were slightly increased (Fig. 2d), here the FPAs were also greatly elevated mainly owing to the enhancement of the CBAs [7, 24]. After the CBA and BGA being enhanced simultaneously, the performance of the cellulase in enzymatic hydrolysis should be bettered in theory. The time courses of the cellulase production by the T. reesei transformants D5, E7 and F6, as well as the control Rut-C30 are shown in Fig. 5. Unlike the observations in Fig. 3, the FPAs of the T. reesei transformants were significantly increased because of the enhancement of CBAs. The FPAs of D5, E7 and F6 had no big difference (Fig. 5a). This is probably because those transformants used the same strong expression cassette of T. reesei cbh2 gene and nearly the same energy proportion of the strong promoter Pcbh1 was used in the expression of the cbh2 gene (here the three genes cbh1, cbh2 and bgl1 were sharing the strong promoter Pcbh1). Figure 5b shows that the transformant F6 had the highest BGA, the second highest E7, the third D5. All the transformants’ BGAs were obviously increased and the differences in the BGAs were caused by the specific enzymatic activities of the different BGL I, which was discussed above. In addition, the BGAs of the transformants E7 and F6 peaked after 4 days fermentation while those of D5 and Rut-C30 ascended continuously. These observations are the same as those in Fig. 3b. Opposite to the results of Fig. 3c, the CBAs here were significantly enhanced (Fig. 5c) because the strong promoter Pcbh1 was used to strengthen the CBH II production which in line with the previous work [4, 7]. All of the CBAs demonstrated continuous increases during the fermentation processes because the strong promoter Pcbh1 to manage the production of CBH I and CBH II at the same time continuously . The transformant E7’s CBAs and F6’s CBAs were nearly the same and both of them were higher than D5’s CBAs, especially during the late fermentation period. The reason for this is unclear. No large differences in EGAs were observed, as shown in Fig. 5d. The tiny increases in EGAs may be because that the improved CBAs did not cause negative effects on EGAs because they do not share same transcriptional factors, therefore no transcription titration effect happened, and/or that the increments of CBAs in cellulase disturbed the EGA determination, making it to some extent raised . The cellulases produced by D5, E7, F6 and Rut-C30 were harvested after 5 days fermentation and applied to the enzymatic hydrolysis of SECS. The results are presented in Table 2. Compared to the cellulase from Rut-C30, the cellulases from D5, E7 and F6 exhibited much more excellent performances in the enzymatic hydrolysis. It is noteworthy, however, that the performance of the cellulase from D5 was to some extent inferior to those of the cellulases from E7 and F6. This must be because the proportions of BGA in those cellulases were not high enough for thoroughly eliminating cellobiose accumulation. The cellobiose concentrations manifested the explanation. The result here indicates that the enhanced co-expression of cbh2 and bgl1 both from T. reesei was not a good strategy for production of more robust cellulase. The key of this problem should be that the specific enzymatic activity of the T. reesei BGL I is too low, which had been proven by comparing the results of the related literatures [20–22]. The cellulases from the transformants E7 and F6 outperformed because their CBAs and BGAs were enhanced at the same time, i.e. the two weaknesses of T. reesei cellulase were overcome meanwhile . Not only the composition of T. reesei cellulase was improved, but also the high yields were achieved by the cellulases from E7 and F6, which were 87.98 ± 0.65% and 86.50 ± 1.01% respectively. The results prove that the beta–exo synergism and exo–exo synergism of T. reesei cellulase were enhanced simultaneously for more robust cellulase, as illustrated in Fig. 6, and thus the cellulose degrading capability was increased. The detailed information about the whole process from SECS to glucose in the context of on-site cellulase production [2, 37] is listed in Table 3. It was found that in general the cellulases from the transformants D5, E7 and F6 where the productions of CBH and BG were enhanced simultaneously were more efficient than the cellulases from the transformants A8, B6 and C4 where only the production of BG was enhanced. This makes sense because the formers had higher cellulase productivities and better synergisms that render cellulase more robust. Though the T. reesei transformant D5 had much higher FPA than the transformants A8, B6 and C4, the enzymatic hydrolysis yield by the cellulase from D5 was lower. Overall, however, the efficiency of the cellulase from D5 was similar to those of the cellulases from A8, B6 and C4. Totally 2.3352 g SECS was needed to produce 1 g glucose when using the cellulase from D5, which was more than those when using then cellulases from E7 and F6. The main problem was that the BG component was no longer enough when the strong promoter Pcbh1 was co-expressing T. reesei cbh2 and bgl1 at the same time. The BGL I from T. reesei was not sufficiently strong in specific enzymatic activity is the crux of the matter because the transformants E7 and F6 in which the bgl1 genes from Aspergillus species were expressed did not have the same problem. The cellulases from the transformants E7 and F6 had the highest efficiencies because both of them had the highest FPAs and enzymatic hydrolysis yields. For these two transformants, only 2.0291 and 2.0573 g SECS were demanded to produce 1 g glucose, respectively. The former’s efficiency was a little higher than the latter’s, but not that different. This suggests that the transformants E7 and F6 were the best among all the T. reesei strains used in this work. Moreover, the lesson from the transformants D5 and A8 enlightens us that the transcriptional titration effect should be considered when using Pcbh1 to express two or more genes at the same time and only using more robust cellulase component could save more energy for other cellulase component. The results of the transformants E7 and F6 are better than those of the recombinant T. reesei in which only the production of CBH II was enhanced by using the strong promoter Pcbh1 in the previous work . This is because only one weakness of T. reesei cellulase was overcome and that recombinant T. reesei did still lack of β-glucosidase . The strong promoter Pcbh1 of T. reesei is not a master key capable of solving all the problems about the cellulase. More holistic angle of view should be introduced into the optimization of cellulase composition at the transcriptional level such as the transcriptional control engineering of the cellulase components as a whole by rearranging the promoters of different cellulase genes and quantitatively regulating their expression levels to push cellulase towards perfection in the context of real-world applications. Therefore, further work should be done to extend more and dig deeper in this research field. Enhanced co-expression of the β-glucosidase gene from A. aculeatus or A. niger and the cellobiohydrolase II gene of T. reesei using the strong promoter Pcbh1 was found to be the best strategy in overcoming the two weaknesses of T. reesei cellulase, deficiencies in β-glucosidase and CBH II. This strategy improved cellulase production by T. reesei and optimized the cellulase composition to better the synergisms and increase cellulose degrading capability. 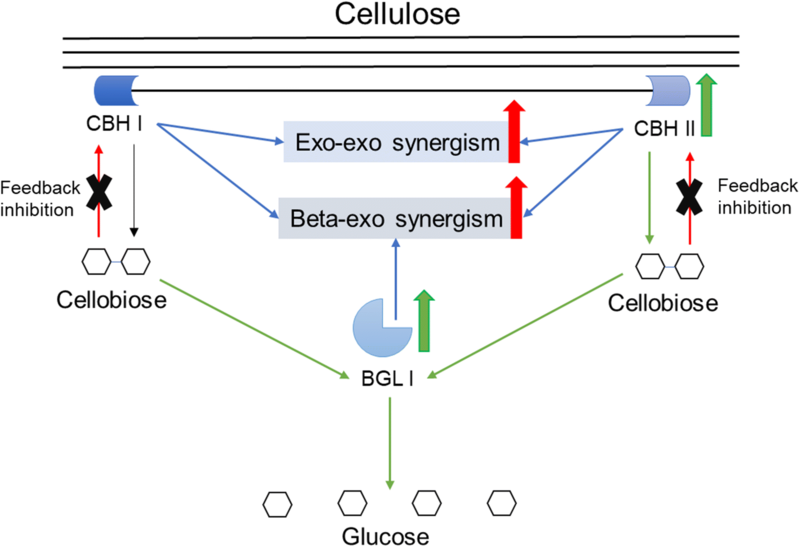 The enzymatic hydrolysis yield and the efficiency of the process from SECS to glucose in the context of on-site cellulase production were greatly improved here by simultaneously strengthening the beta–exo synergism and exo–exo synergism in T. reesei cellulase. This work serves as a modest spur to optimize the T. reesei cellulase at the transcriptional level by transcriptional control engineering. HF and CZ conceived the ideas and designed the project. HF, RZ and CL performed the experiments. HF analyzed the data. HF and CZ wrote the manuscript. All authors read and approved the final manuscript. This work was financially supported by the General Grant for Young Scholar (2018JQ2022) and the second-class General Postdoctoral Grant (2017BSHEDZZ100) from Shaanxi Province, the Special Funding, first- and second-class General Financial Grants from the China Postdoctoral Science Foundation (2018T111102, 2016M600815 and 2017M613213), the Fund for Doctoral Scientific Research (Z109021632) and the Start-up Fund for Talent Introduction (Z111021602) from Northwest A&F University. The General Grant for Young Scholar (2018JQ2022) and the second-class General Postdoctoral Grant (2017BSHEDZZ100) from Shaanxi Province, the Special Funding, first- and second- class General Financial Grants from the China Postdoctoral Science Foundation (2018T111102, 2016M600815 and 2017M613213), the Fund for Doctoral Scientific Research (Z109021632) and the Start-up Fund for Talent Introduction (Z111021602) from Northwest A&F University.